Organizations have identified the prowess of web content management as a strategy to hone their marketing game-plans. With simple, intuitive and illustrative models, WCM providers offer competitive solutions, consulting and support. 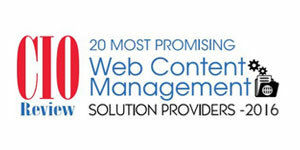 In order to assist CIOs in identifying the right web content management solution providers, CIOReview presents Top 20 Most Promising Web Content Management Solution Providers 2016. Acquia Enables organizations to leverage Drupal—a leading open source technology— to drive the customers’ digital experience. AgencyQ Provider of social, mobile and interactive solutions driven by web technologies. AOE Inc Enables unique customer experiences through enterprise web content management and maintains the website efficiently. Aquilent Provider of web-based solutions for the federal government. Bridgeline Digital Provides iAPPS platform that integrates Web Content Management, eCommerce, eMarketing, and web Analytics capabilities. CMSWire Provides Episerver Web CMS to gain control and deliver an optimized experience for the users across mobile, desktop, social media, and email. CrownPeak Provides software-as-a-service delivery model for web content management systems. dotCMS Providing dotCMS Enterprise Cloud—the SaaS content management and digital experience platform without limits. e-Spirit Enables clients to unlock the value of digital content and transform the way they communicate with customers and employees. Episerver Enables editors and marketers to create and experience content simultaneously through the web content management systems. Hippo Engineers an advanced content performance platform and delivers web content with value in any context and on any device. Ingeniux Empowers developers and content creators to build website with products for ease-of-use, rapid deployment, extensibility, and low total cost of ownership. Marketpath Provider of web design, development and on-demand Web Content Management solutions that enables efficient management of websites for non-technical and technical users. OmniUpdate Provides content management solutions that streamline content administration and solves the digital marketing and communication challenges of higher education. PaperThin Offers a web content and experience management platform that helps organizations create web experiences and drive high-impact results. Primero Systems Provider of a robust, highly-flexible marketing platform that includes a powerful content management solution. Upland Software Provider of cloud-based Enterprise Work Management software to manage their projects, professional workforce and IT investments via the web and mobile technologies. Vasont Systems Provides component content management software and XML data services to different global organizations. Zesty.io Zesty.io is a native SaaS/Cloud platform that enables marketing teams to launch enterprise level websites without involving IT or software engineers, resulting in faster deployment at a lower cost.